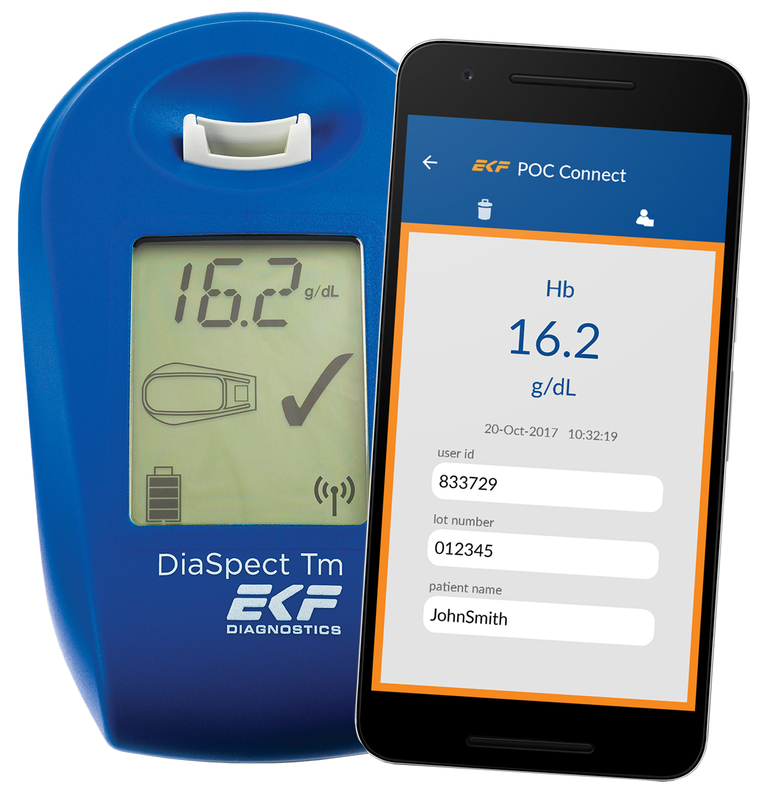 EKF Diagnostics has introduced POC Connect - a data management smartphone application for its DiaSpect Tm haemoglobin analyser. Lightweight and palm-sized, the DiaSpect Tm analyser delivers laboratory quality haemoglobin results within two seconds at the point-of-care (POC). Now with the availability of POC Connect, this makes it ideal for mobile health checks and anaemia screening in a range of locations, environments and climatic conditions. The new POC Connect mobile app is a simple Android application that enables the storage, access and transmission of haemoglobin results directly from the DiaSpect Tm analyser to a smartphone via Bluetooth technology. DiaSpect Tm can be purchased with integrated Bluetooth, meaning there is no need to purchase an additional external Bluetooth dongle. This new POC solution will prove useful in countries with challenging environmental and geographical conditions where remote haemoglobin testing and access to internet can be difficult. All that is needed is an Android phone and DiaSpect Tm device to record haemoglobin results with dates and times and then add unique identifiers, such as Patient ID, User ID, QC information, Cuvette LOT numbers and comments. Data is synched and stored on the smartphone in a history list for easy access. Data can then be transferred at any time as a protected CSV file and added to a central database or lab information system (LIS) as required. Handheld and portable, DiaSpect Tm is ideal for POCT not only due to its unmatched measurement speed, but also through its extensive battery life of 40 days continuous use, and up to 10,000 tests, without need for a recharge. Additionally, its reagent-free microcuvettes have up to 2.5 years shelf life, even after opening, and are unaffected by temperature or humidity. These disposable cuvettes can be stored from 0 to 50°C, meaning temperature controlled storage is not necessary - short term storage is even possible at -30°C to 70°C for 24 hours. This makes the device highly suited for testing in remote and/or hot and humid environmental conditions, or sites with low test volumes.